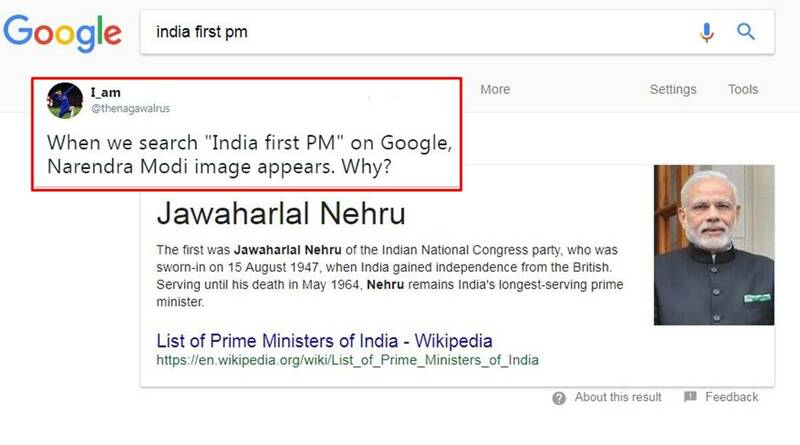 People have been sharing screenshots of the 'Indias first PM' Google search result page that shows Jawaharlal Nehru's in big and bold lettering, but current PM Narendra Modi's photo, asking Google why. Well, here's the reason. The ‘India first PM’ search result page showing Narendra Modi’s photo with Jawaharlal Nehru’s name is because of a technological quirk. Here’s how. There was a sudden flurry of activity on social media, after someone googled “Indias first PM” and found that the top result showed current PM Narendra Modi’s picture along with Jawaharlal Nehru’s name, and most wondered why. It was a technical quirk. When one types “Indias first PM” on the Google search engine, the first link that appears on the search page is that of the Wikipedia page of the ‘List of Prime Ministers of India’, with Jawaharlal Nehru’s name in bold and big letters, and a brief description of Nehru. That was all fine, but the twist came in the form of the image, which was not of Nehru with his signature cap and button rose, but of Modi. Since the uproar, it seems the results page has been tweaked to not show the photo any longer. Though it’s uncertain when this quirk happened, but the social media suddenly fraternity discovered it early April 25, when someone took a screenshot of the search result page and tweeted it out. Many others followed suit, taking screenshots of their own and sharing them on social media, with variants of the question: Why? When we search “India first PM” on Google, Narendra Modi image appears. Why? Has Nehru been generous to Modi let him use name and title of First PM? While Google has not yet responded to any of these questions, one reason might be a technological quirk that showcases the first image on the Wikipedia page of the ‘List of Prime Ministers of India’, which – upon opening – clearly states that Narendra Modi “is the current (14th) Prime Minister of India, since 26 May 2014”. 2. The first image on the Wikipedia page is of Narendra Modi, PM. 3. When displayed on a narrow screen, the image comes up first. Oh well, turns out, there is an explanation for this after all.